This was Human Bill, never to be confused with Workplace Bill. Belichick wheeled his bags past some Ryder moving trucks and then disappeared into a night and a plane ride that would surely include a little studying of the Los Angeles Rams some 17 years after he launched his epic career with a Super Bowl upset victory over the St. Louis Rams. In some ways, Belichick the coach had to overcome Belichick the personnel overlord. When measured against its five championship teams, this Patriots roster always looked supermodel thin. Belichick spent much of the season with no explosive playmakers on the outside, and no pass-rushers who could figuratively kill the other team’s quarterback. He didn’t have the suspended Julian Edelman for the first four games of the season, and he didn’t have the first-round pick secured in the Brandin Cooks trade, Isaiah Wynn, for the entire season after the offensive lineman went down because of a torn Achilles in the summer. 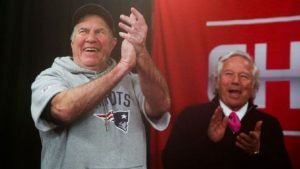 Belichick also had to overcome perhaps the worst regular-season coaching blunder of his career — the decision to put the mummified remains of Rob Gronkowski on the field against Miami to defend a final play Hail Mary that was never going to happen, a decision that cost his team a chance to play this AFC Championship Game in Foxborough. Deep down, Belichick knew he owed one to his Patriots. He knew he had to come up with something Sunday night for failing to give his team its best chance to win against the Dolphins in December. But Belichick and Brady are the best of all time, and yes, there is a difference between historically great and currently very good. The second half and overtime were defined by exhilarating plays by the quarterbacks, excruciatingly tense replay reviews and refereeing decisions, and the terror felt by league executives everywhere who were hoping, praying, that a botched call wouldn’t cost New England or Kansas City a trip to Super Bowl LIII the way one cost the Saints in the Superdome earlier Sunday.